Kathrine Switzer is one of the most famous endurance runners of the twentieth century – not for her performances but for a milestone event. In 1967 she was the first woman to officially enter and complete the Boston Marathon, one of the longest-established marathon races. I’ve recently listened to five interviews with women runners aged over 60. These interviews are from Marathon Talk, a weekly podcast all about running hosted by Martin Yelling and Tom Williams. 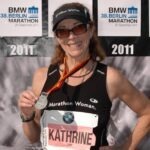 In April 2012 Marathon Talk interviewed Kathrine Switzer. In the UK we have become used to seeing women compete at the highest level in distance running, from 10ks to marathons and ultras, but it was a very different picture in the 1960s when women were excluded from marathons and were not even permitted to compete at shorter distances (the 1500m was not introduced at the Olympics for women until 1972). Although a few women did compete in marathons they most often did so unofficially and their times were not recorded or recognised by race organisers or athletics governing bodies at the time. In 1966 Roberta Gibb had run the Boston Marathon without entering officially and without a bib number. She hid in the bushes and joined the race as it started, finishing in 3 hours 20 minutes 40 seconds in 126th place out of over 400 runners. Gibb also ran in 1967 but it was the media coverage of Kathrine Switzer’s run which gained worldwide attention. In 1967 Kathrine Switzer was a journalism student at university who persuaded her athletics coach that she would be able to complete the marathon distance. She had run 31 miles in training. There was nothing in the race rules for Boston that said women could not enter. Switzer registered for the race as “K.V.Switzer” which was the way she usually wrote her name. 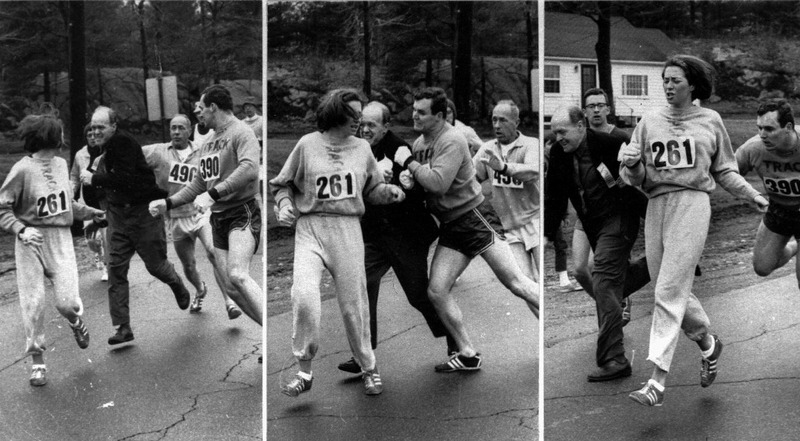 This series of photographs shows the moment when the enraged Race Director realised that a woman had entered the race and tried to push her off the course, only to be pushed away himself by Kathrine Switzer’s boyfriend. The press car was there, the event was captured in these dramatic shots and the ensuing media coverage made this a defining moment in women’s struggle to be admitted to the all-male preserve of distance running. The Race Director subsequently disqualified Switzer but a change in attitudes was coming and in 1972 women were permitted to enter and race at Boston for the first time. As she was running the Boston Marathon Switzer realised that what had happened to her had a wider and deeper significance. This made her determined to finish the race to show that women could be serious runners, and she made a commitment to enabling other women to race. She went on to campaign for women’s right to compete in distance races. Working with Avon as sponsor she established a series of international women-only races. Four hundred races took place in 27 countries across the world and they played a significant role in getting the women’s marathon included in the Olympics. You can watch a 2014 BBC Witness interview with Kathrine Switzer which shows footage from the 1967 Boston Marathon. Switzer recounts the events of that day and talks about her work to get the women’s marathon included in the Olympics. The BBC clip inaccurately describes Switzer as “the first woman to run the Boston Marathon”. Switzer was the first woman to run it officially, having filled out the application form. But Roberta Gibb had run Boston without permission in 1966, her formal application to enter having been turned down on the grounds that women were not physiologically capable of running marathon distances. She also ran Boston again in 1967 and 1968 and women runners carried on doing this each year until they were officially permitted to enter in 1972. All these women who ran without a bib number also played a part in changing attitudes towards women’s participation in endurance running. Kathrine Switzer returned to run the Boston Marathon in 1972 along with seven other women who all completed the race. She went on to win the New York City Marathon in 1974. Switzer is still running marathons and plans to run the Boston Marathon again in 2017 when she is 70, on the fiftieth anniversary of her first race there. Read my article about pioneering British marathon runner Joyce Smith who won the first London Marathon and competed in the first women’s marathon at the Olympics aged 46, finishing 11th.